Following the funeral of Helmut Kohl in July 2017, Viktor Orbán declared that he was persuaded by the then German Chancellor to believe in the Great Truth of the founding fathers: “Europe will have a Christian existence, or it will cease to exist”. Indisputably, Christian Democracy played a quintessential role in drawing up and solidifying the building blocks of the Union, since founding member states were predominantly led by Christian Democrat parties (or they were part of the leading coalition) in the post-Second World War era. Helmut Kohl, both in physical appearance and historically a giant figure in German and European politics, was a rightful successor of the pro-integration, pro-European, international Christian Democrat ideal. Kohl managed to de-escalate tension surrounding Germany’s reunification; he largely facilitated the 2004 Eastern enlargement of the EU (although by then he was not in government); and he fiercely campaigned for the Eurozone despite harsh criticism from within his own country. He was equally German and European. When he invited Fidesz to join the European People’s Party (EPP) in the early 1990s, he might as well have seen the rise of another prominent Christian Democrat in the young rebel Viktor Orbán, with a great potential to unify Europe. The recent suspension of his party from the EPP – right before the European Parliament (EP) elections – is a clear manifestation of the exact opposite. It’s not far-fetched to say that neither Europe, nor the inherently diverse EPP have ever been more divided, and it’s still up for fierce debate whether the suspension of Fidesz on the basis of Weber’s tactical Wunderplan will provide some remedy. I wish my hopes were a closer reflection of reality. Background – Unilateral suspension or mutual agreement? At the beginning of March, 12 member parties of the EPP from Portugal, the Netherlands, Belgium, Luxembourg, Finland, Lithuania, Greece, Sweden, Bulgaria and as an associate member from Norway initiated the total exclusion or suspension of Fidesz from the largest Political Group of the European Parliament. The immediate cause that precipitated suspension was the aggressive, racist, utterly hostile placard campaign of Fidesz, which featured Jean-Claude Juncker, Commission President alongside George Soros, as an evil conspirator, who is adamant about channelling hordes of migrants into Europe. In addition, the EPP’s official online communique hints further deep-rooted concerns with Orbán’s party, such as disrespecting democracy, equality, the rule of law and human rights, codified as basic EPP values in the emergency resolution “Protecting EU Values and Safeguarding Democracy” adopted at the Group’s Helsinki Congress on 7-8 November, 2018. “the suspension entails no attendance at any party meeting; no voting rights; no right to propose candidates for posts”. It all sounds convincingly straightforward and satisfying: the destructive, wrongdoer Fidesz was sidelined, thanks to the decisive, firm actions of EPP leaders. The situation of course is a tad more complicated and one does not have to go further than again the EPP’s official online communique, in order to understand why. Essentially, the EPP website announcing the suspension of Fidesz claims that “The EPP Presidency and Fidesz jointly agree that Fidesz suspends its membership in the EPP”. This is the first telling feature of Weber’s political Wunderplan, which leaves enough space for Fidesz to communicate expulsion at home, as a mutual compromise that they equally approved. In fact, the 190 candidates voting for suspension included several Fidesz members. Meanwhile, Weber can demonstrate during his election campaign, to the growing number of Orbán critiques within his party, that he does not shy away from using “harsh means” to protect core EU values. Secondly, Fidesz has not been expelled without a chance to restore the party’s full-fledged EPP membership. Weber issued an ultimatum of three points, which must be implemented to regain trust in Fidesz: two related to the hatred campaign (eliminating the appalling Juncker placards and apologising for the damage already done), and one to the destiny of the Central European University. It is worth noting that some billboards have already been covered in mid-March, when Weber visited Hungary – of course, by sheer coincidence, those which were erected on the route from Budapest Airport to the city centre. Whether Orbán and his party fulfil the above points will be monitored by an Evaluation Committee consisting of Herman Van Rompuy, Hans-Gert Pöttering and Wolfgang Schüssel – in the Hungarian media often mentioned as “Council of the Three Wise Men”. In due course (whatever it means, I guess post-EP elections) they will produce a report, which will assess the aforementioned three-point criteria, and the state of core EU values in Hungary. This is the second bit of Weber’s political Wunderplan, that I sincerely thought at first sight, was a cunning, highly tactical move, with the potential to tone down Orbán’s hatred campaign, as well as preventing him from jumping on Salvini’s populist train. A great number of media outlets described the “suspension compromise” as a timid attempt to restrain Orbán, and a missed opportunity that aims solely at maximising the EPP’s electoral success. At the end of the day, it’s been projected by various opinion polls that Fidesz could boost with 12-13 delegates the number of EPP MEPs. In sharp contrast, I am convinced that the concession on offer is brilliant, agile and has a great potential to be effective, which is a testament to Weber’s political prowess. First of all, the outright, total exclusion of Fidesz would have given them no other choice, but to immediately start building a right-wing populist coalition with Salvini, Le Pen and their acolytes. It is needless to say that it would have been highly undesirable, provided right-wing populist parties are expected to make significant gains. In addition, it instantly became apparent that Orbán indeed agreed to soften – and I must say to a very great extent – his anti-EU, spiteful billboard campaign. Personally, it was deeply upsetting whenever I went home to visit my beloved, picturesque Budapest, that I just could not avoid constantly bumping into a myriad of such installations; and it wasn’t a unique feature of only the capital. I don’t quite understand why the EU or the EPP did not take action earlier, as the anti-EU placard war has been an ongoing mission since 2015-6. It constantly fuelled political toxicity in the entire country, and a sense of being at war with Brussels. Right now, the government is replacing the Juncker/Soros billboards, with a promotion campaign for its new pro-family policies. Take a look at the following tweet, to find out why an unfortunate design failure created a laughing stock out of the new placards. Well, at least the hatred campaign has started to abate for sure. In sharp contrast, I am convinced that the concession on offer is brilliant, agile and has a great potential to be effective, which is a testament to Weber’s political prowess. First of all, the outright, total exclusion of Fidesz would have given them no other choice, but to immediately start building a right-wing populist coalition with Salvini, Le Pen and their acolytes. 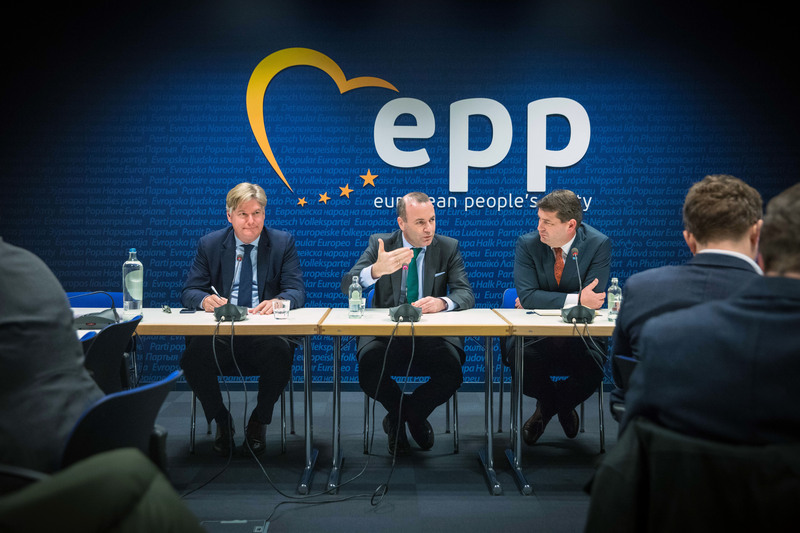 All in all, I’d say it is pretty obvious that Weber and the EPP leaders took into consideration how they could maximise their political gains at the upcoming EP elections, when the suspension plan was created. This is an essential, basic feature of making politics. However, the compromise has much more complex dimensions and an awful lot more to offer than electoral victory. So whatever happened to Christian Democracy? The real efficiency test of Weber’s Wunderplan was on Monday (8th April), when Salvini assembled a group of far-right “neo-Christians” to discuss their election tactics. If Orbán or a Fidesz delegate had attended the meeting, that could have diminished absolutely the success of Weber’s compromise. Fortunately, the Hungarian Prime Minister was pragmatic enough, not to make such a blatant move. Nevertheless, some cracks have already started to manifest, when the Fidesz party leader on Friday, 5th April presented their seven points election manifesto, amidst cynical references to Brussels, Weber and Juncker. The placard war on the streets as of now might be over, but it will not stop Orbán from posing as the saviour of Europe: the only one who truly represents Christian Democracy and Christian values, in sharp contrast with bureaucrats in Brussels. Consequently, the suspension compromise can only provide a temporary alleviation of the EPP’s populist problem, and it will not eradicate the amorph identity politics of Fidesz and its friends around Europe, which implements Christianity only at a twisted rhetorical level. Would Helmut Kohl still see a novel unifying force in the Hungarian Prime Minister? Would he approve his (illiberal) Christian Democracy? And, would he still be willing to invite Fidesz to join the EPP? Unfortunately, the great European politician, the only one who could offer non-speculative answers to these questions, is not with us anymore. Dora was born in Budapest, but her family originates from two tiny villages in North-East Hungary, that she equally calls home. She’s been living in London since 2012, where she attained her BA diploma in International Relations (Queen Mary University), and MSc degree in Global Europe: Culture and Conflict (London School of Economics). She worked two years in diplomacy between her undergrad and postgrad years. Dora is currently Events Manager at LSE IDEAS, ranked world’s second best university affiliated think tank by the 2018 Global Go To Think Tank index.